Lesiure Solutions is proud to present its highly prestigious Company of Choice profile to Skydive Netheravon. Based at Netheravon Airfield, Netheravon has a long and vibrant history, originally being used before the First World War for balloon operations. The Royal Flying Corps also used the airfield before becoming the Royal Air Force in 1918. It became RAF Netheravon; a training and operational base, during the Second World War and by the early sixties was taken over by the Army Parachute Association. It is now the worlds’ longest continuously operated airfield and the largest parachuting landing area in the UK. The Army Parachute Association (APA) provides parachute training for members of the public over the age of sixteen as well as the military, and has some of the UK’s best military and civilian instructors. The purpose of the APA is to promote and encourage sports parachuting for military personnel whether active, retired or disabled. 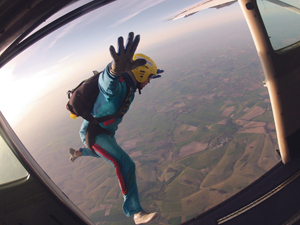 Operating as a not-for-profit organisation, Skydive Netheravon is dedicated to reinvesting and improving its services and facilities for its members. “The people that come to us usually give us a 5* rating afterwards on Facebook and testimonials.” commented Marketing & Media Manager, Julie Cooper. One of the many testimonials include: “I just wanted to say what a fabulous day we had on Saturday! Very well organised and a great day, safe, fun, exhilarating and wonderful family day… Next Saturday we are wing walking!!! Been an exhilarating couple of weeks!!! Thank you for all your help organising the surprise” says Annette. Skydiving Netheravon also offers the perfect opportunity for charities or individual fundraisers to raise money for various causes. Skydivers can make jumps wearing charity t-shirts or even go in fancy dress, which gives a great awareness for the charity. Their future plans are to continue to teach skydiving to those who want to learn, using the best practice from some of the best military instructors around. This entry was posted in Leisure Solutions and tagged Parachute, Sky Diving. Bookmark the permalink.